An office worker spends, on average, six hours of their workday sitting at their desk. Unfortunately, spending that many hours inactive during your day increases your risk of several health conditions, including some forms of cancer. The connection between inactivity and cancer is not entirely clear, but specific cancer biomarkers, such as c-reactive proteins, are recorded at higher levels in people who spend a lot of time sitting. If you sit at a desk to earn a living, you are also 34 percent more likely to develop heart failure than someone whose career involves standing or another form of physical activity. In fact, a sedentary lifestyle increases your risk of developing several serious medical complications. You may already make an effort to move more during your workday. Maybe you walk during your lunch break or park further away from the office so you can log more steps before punching the time clock. These are reasonable measures to take to improve your health. Good job. You could further reduce the health risks associated with your office job by standing at your desk. The standing desk isn’t a new idea. During the 18th and 19th centuries, standing desks were often found in the offices and homes of the wealthy. Ernest Hemingway, Benjamin Franklin and Virginia Woolf are just a few noteworthy standing desk enthusiasts. When the test subjects returned to sitting while they work after concluding the study, they reported feeling as they did prior to the research period. Many of the test subjects returned to using a standing desk. 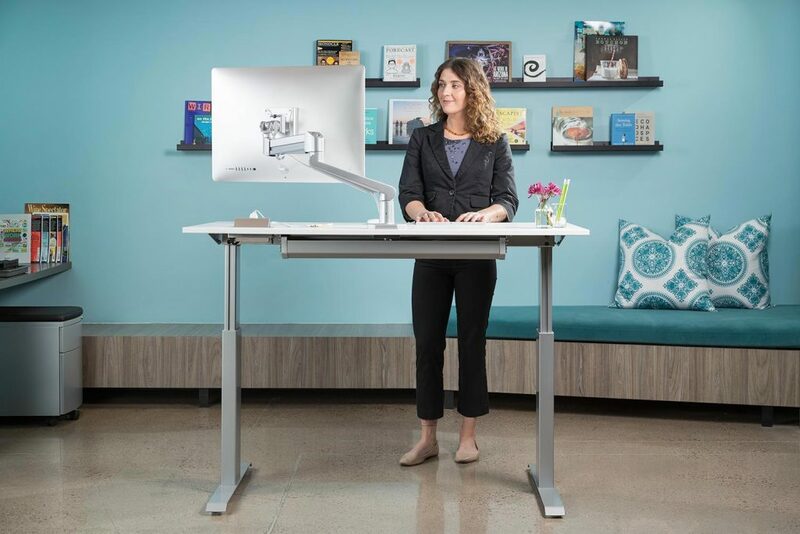 One of the most effective ways to incorporate more standing time into your workday is to invest in a convertible standing desk that can be used sitting or standing. If that’s not a practical solution, you could opt to have a tall chair available for periodic use with your standing desk. Your goal is to alternate between sitting and standing, with more time spent standing. You may find that some activities are still best performed while sitting, but many of the tasks you perform throughout your day are no more difficult at a standing desk. Reading documents, checking email, telephone conversations and small writing tasks are easy to accomplish while standing. Offices have changed over the years. Many companies support their workforce by encouraging strategies that help keep their employees healthy. That may explain why so many companies support the use of standing desks for their associates who want to use them.